Time is going by so quickly that I’m starting to feel like I’m some kind of alternate universe where there’s about ten less hours in a day. How is it March, already? HOW? Dimensional time problems aside, it’s Friday, which means it’s time for BOOK CLUB! All righty, let’s get started. Meet Charlotte Summers – a twenty-something gal who thinks she has it all: a loving fiancé and the opportunity to study French abroad in Paris. Hard life, I know. That all changes QUITE quickly, though, when she finds her fiancé’s online dating profile mere days before they’re supposed to move halfway across the world. Not only did he have a profile but was actively cheating with some redhead. This isn’t a book that’s filled with twists and turns. 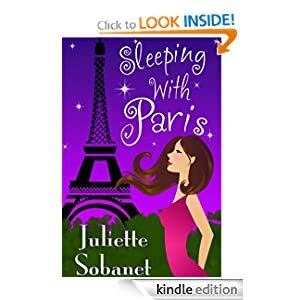 It’s fairly easy to imagine what Charlotte’s going to do in Paris: be sad, drink too much, fall apart, date other guys, but it was Ms. Sobanet’s descriptive narrative and dialogue that kept me invested. Whenever there was a scene involving food, my mouth watered and I’d rush into my kitchen to whip up a crepe with strawberries and chocolate. The chocolate! Oh, the CHOCOLATE! Charlotte lets pieces melt on her tongue throughout the entire novel and, well, let’s just say that you might put on a little weight because each time, Ms. Sobanet describes the texture so perfectly that you’ll be running to the store. On second thought, buy chocolate BEFORE you read. Yeah, that’s a better plan. Charlotte lives in an area of Paris that I’m familiar with and it felt like I was walking along side her as she wandered. The bar scenes are particularly funny as French men really do have an inability to understand personal space and how painted-on pants aren’t the best look. Oh man, did those scenes ever take me back. Haha! The only thing that I didn’t like in this book was Charlotte’s blog. It was intended to be a way for her to act “like Samantha” from SATC and date like a man. But instead of coming across as an empowered woman who was in charge of her sexuality (which I was expecting with the Samantha reference) she made me sad. It didn’t seem authentic, to me, how detached Charlotte’s blog was from how she was living her life. It made me feel sorry for Charlotte because people with little self-awareness make me…well…sad. That being said, Charlotte’s in her mid-twenties, just had her heart broken and moved to a foreign country - alone - so I gave her a break and played along. So, I’d say this is a solid debut novel. Ms. Sobanet managed to keep me invested in a character that I didn’t like at times and that’s quite an accomplishment because I’m a hard-sell in that department. If you’ve been to Paris, you’ll love the memories that will surely float behind your eyes and even if you haven’t, I have no doubt that you’ll be swept away before you know it. Juliette Sobanet has just released another chick-lit novel, aptly titled: Kissed in Paris, and it looks juuuuuuuuuuicy. I can’t wait to bite right in. Then, the lovely Ms. Sobanet offered to send me a version that would work! How nice is that? I simply adore authors who care about their readers and Ms. Sobanet is clearly one of them. Aww, I love that the author sent you a new copy! I'm going to add this to my list. This sounds really cute! I am adding it to my to read list! It sounds like a book I'd like. I'll have to put it on my list, which is a mile long right now! I love that the author sent you a copy that was compatible with your Kobo. It's so nice to hear when authors do nice things like that!